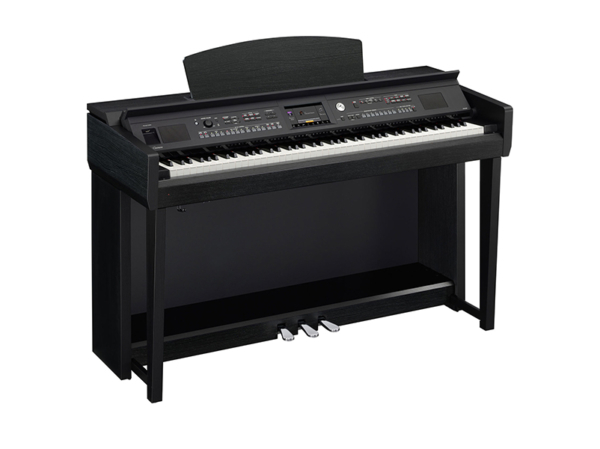 The Yamaha CVP-705 – Featuring the RGE Sound Engine for outstanding playing response and the GH3 (Graded Hammer 3) keyboard with synthetic ivory keytops for maximum playing comfort, the CVP-705 offers extremely high quality piano performance. Featuring the Real Grand Expression (RGE) Sound Engine for outstanding playing response and the Graded Hammer 3 (GH3) keyboard with Synthetic Ivory keytops for vintage piano touch, the CVP-705 offers extremely high quality piano performance. 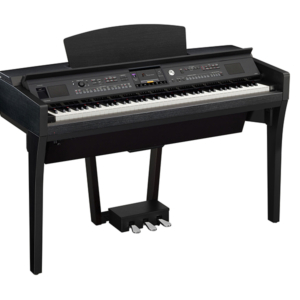 But you’ll also experience a degree of playing satisfaction only found on Yamaha CVP Series Clavinova digital pianos. Choose from hundreds of ultra-realistic instrument Voices. Learn to play hit songs with professionally-arranged accompaniment. Plug in a microphone to sing-along with on-screen lyrics for karaoke fun. Plus, you can add lush harmonies to your singing voice with virtual backup singers. The color touch panel is simple to understand and makes operating a wide selection of functions quick and easy. You can also wirelessly connect your iPhone, iPad or iPod touch to easily share the music you make with friends. With the CVP-605, endless musical fun is always close at hand. 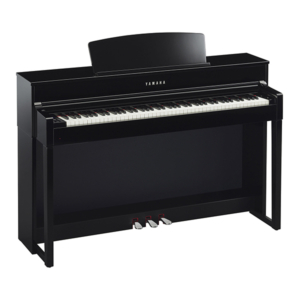 The Clavinova uses the RGE (Real Grand Expression) Sound Engine,the next-generation piano sound source. This lets you enjoy the playing response and expressive capability of a concert grand piano. It features a new Smooth Release function which can express sound with great clarity, and clearly enunciate staccato notes with the sound of lingering resonance heard when gently lifting your fingers from the keys. It succeeds in capturing the essence of a piano performance to create grand piano-like, richly expressive experiences. 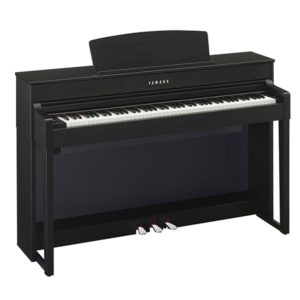 Clavinova subtly reproduces even the unique resonances of an acoustic piano. It features String Resonance that expresses the mellow sounds of the other strings resonating, and Key-Off samples that actually deliver the delicate change in sound the instant the damper touches the string, just before you raise your finger from the key. The addition of these sounds results in tonal resonances that are not only beautiful, but also deep and rich. The GH3 (Graded Hammer 3) keyboard faithfully reproduces the touch of a grand piano. Pianists enjoy a touch that clings firmly to their fingers, just like the ivory keyboards historically used in top-class pianos. Synthetic ivory keytops feature a soft, slightly porous surface that gives all keys added grip and natural friction for improved ease in playing, especially during long performances or practice sessions. The keys’ smooth, refined texture imparts a feeling of luxury and is easy to clean. 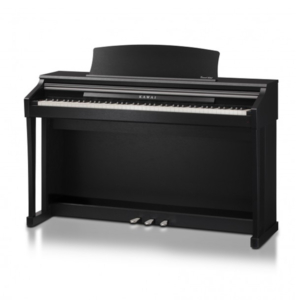 The CVP-705 offers a great new feature called Piano Room that you can use when you really want to concentrate on piano performance and savour the piano sound. You can select from among four types of pianos – grand, pop grand, upright and honky-tonk – and also a playing location, such as concert hall, cathedral or stage. Instantly, the tone quality changes to match that piano and place, giving your performance a totally different feel. When you’re playing the grand piano or pop grand, you can even choose to have the “virtual” piano lid open or closed. Wide variety of Voices for amazingly realistic instrumental sounds. Super Articulation Voices reproduce true effects, as if you are playing that actual musical instrument. Play along with any number of virtual bands where you’re the band leader. Plug in a microphone, and you can sing along with your playing. Play accompaniment to your own composition, or play along with a talented friend. Singing will add more fun to your home parties. You can enjoy karaoke backed up by songs stored in your Clavinova or downloaded from the internet. The lyrics are shown on the display*, and the letters change color as the song advances, so it’s perfect for bursting into song. Display the lyrics on a big TV screen so everyone can join in and the party will pick up steam. * Only if the song data includes lyrics. Using the Vocal Harmony function will add the lush harmonies of a chorus, even when you’re singing alone. You can also have fun with vocal effects like vocoder, which makes your voice sound robotic. If you use an iPad, iPhone or iPod touch, Yamaha apps will make playing more convenient and enjoyable. Play a song and easily set the ideal Voice and accompaniment Style. Record your own performance and share it with a friend. Check out the apps and find the ones that meet your needs. Note: Some apps require a connection to your instrument. To use apps connectivity, a wireless* or wired connection (with Yamaha i-MX1) are necessary. *Wireless connection requires a wireless router and the bundled USB wireless LAN adapter. The USB wireless LAN adapter may not be included depending on locale due to local regulations. The Yamaha CVP-709 - "Real Grand Expression" Sound, touch, pedals–perfectly integrated to give you the sensation of playing a grand piano.